The Düsseldorf international boat show held its 50th edition in January 2019. Simply known as the “boot” (German for, and pronounced like boat), it is the world’s largest trade fair for all things related to recreational boating and watersports. This was definitely a huge event, with more than 2000 exhibitors from 73 countries spread over 16 themed halls covering 220,000 square meters. The 9 days long 50th edition attracted 250,000 visitors who traveled to Germany from 100 countries. Name it, they had it! It goes without saying that boating and sailing were the main attractions. Insanely luxurious yachts were the stars of the show. Are you looking to add a portable submarine to your 26 meter monster yacht? This was the place for you. On a more serious note, exhibits covered every water related activity, complete with separate pools for paddling, fishing, bodyboarding, scuba diving and surfing, as well as a huge wakeboard pool and a sailing basin with fan-generated wind. Did I mention this was a huge event? 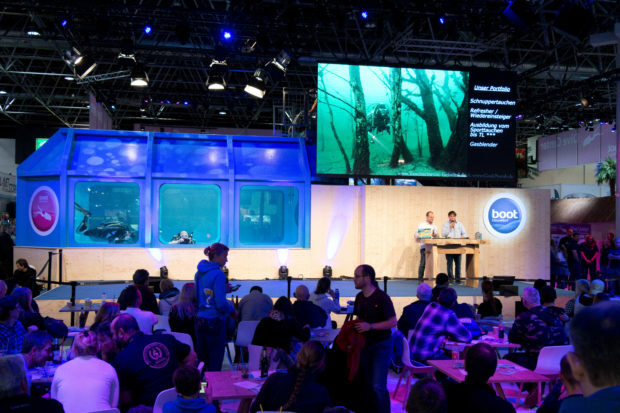 More relevant to DIVER magazine readers, the boot is also the largest scuba diving show in Europe. Scuba is a long-time favorite at the show. In fact, a third of the visitors come with our favorite sport in mind, making for the busiest of all boot halls by far. With 570 exhibitors in the diving hall alone, it is a close second only to the Diving Equipment & Marketing Association (DEMA) show in the USA. As I started my visit, I quickly got engulphed by the euphoric atmosphere that reigned throughout the diving hall. Representatives from the major training agencies were in attendance to answer questions about their curriculum. Travelers could hook up with travel agencies, tour operators and dive centers from all imaginable diving destinations. Several large European dive stores were on location for those looking for bargains. The boot is also a great place to establish business contacts with people from all over the world. I must say I was really impressed with the lineup as I got to talk with business owners and CEOs who were keen to share their passion for our sport. There were continuous presentations from the industry, as well as lectures from world renowned athletes and filmmakers on the diving hall center stage which was flanked by a 5 meter deep diving tower for equipment demonstrations and a shallower pool for tryouts. I felt privileged while listening to Guillaume Néry present the short movie “One breath around the world” and discuss the numerous challenges they faced to ensure continuity despite filming over so many locations. And, I was moved by Julie Gautier’s “AMA”, an inspirational movie that brings dance to the underwater weightlessness. She described the two months long artistic journey that made this movie so powerful. Given the show’s magnitude and visibility, equipment manufacturers jump on the opportunity to showcase their latest products. While surveying the diving hall, I was surprised by the number of drysuit manufacturers I had never heard of. I counted a total of 17 different brands at the show and I’m sure I missed some. I couldn’t help but notice that most high-end models are converging to the same design: shell suits with front entry and pockets on each thigh. Diver Propulsion Vehicles (DPV’s) are rapidly evolving. Long gone are the days of heavy and cumbersome lead-acid batteries. Carbon fiber and Li-Ion batteries are now ubiquitous. A single DPV won’t do? Most manufacturers had tandem versions on display, that’s if your wallet is thick enough. Gavin showcased its Gavin 95 prototype with dual counter-rotating torque-cancelling propellers. Bonex premiered their brackets for mounting accessories. Carbon Scooters had their complete line of DPVs on display. Divertug premiered their top-of-the-line 42DT DPV. Suex introduced the ERON D1 dashboard along with a renewed DPV line-up with the choice of Li-ion batteries for maximum autonomy, or NiMH for travel. The rebreather market is growing fast as evidenced by the 11 different manufacturers present. 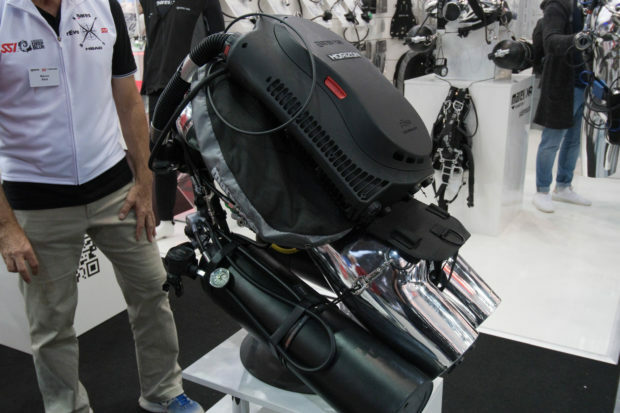 Mares really stole the show by premiering its Horizon semi-closed rebreather developed in collaboration with rEvo. The Horizon was designed to bridge the gap between open circuit and rebreather technology. It works off stage bottles rather than smaller back-mounted cylinders. It provides constant oxygen fraction for runtimes of up to 3 hours and a maximum depth of 40 meters. If you’re into mixed-gas tech diving, you know that every helium molecule counts. MPS premiered their electrical gas booster at the show. They also showcased an extensive line of gas boosters including portable and expedition models. I was impressed by the attention to details that make their products look like they come from the aerospace industry. 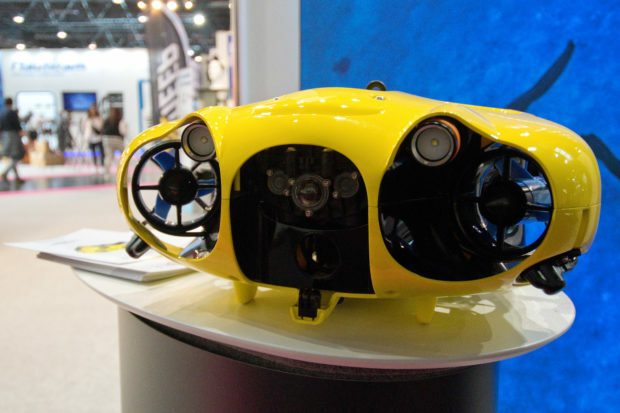 IBubble featured their surprisingly impressive autonomous underwater drone production model. 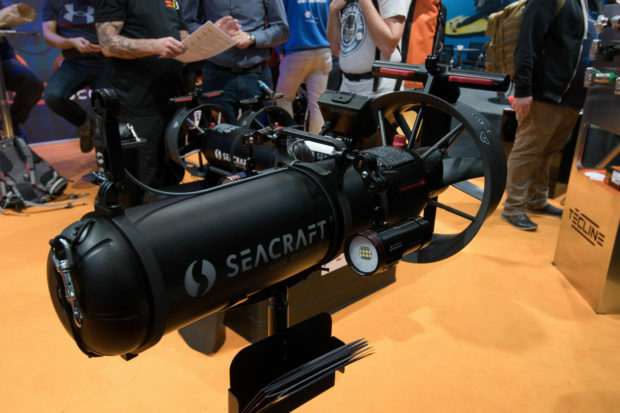 Designed and manufactured in France, it tracks divers using an acoustic navigation system supplemented with image recognition and obstacle avoidance. It comes with a one hour autonomy at a maximum depth of 60 meters and is compatible with all action cameras. However, with its price tag of 3 500 euros, it is more likely to appeal to resorts and charters than the general public. Underwater photography had a dedicated section next to the diving hall. The long established Nauticam, Seacam and Subal each had their own expansive kiosks. Isotta and Easydive, two Italian housing manufacturers were also present. Easydive’s approach to housing design is interesting in that their leo³ line is based on a few universal and adaptable DSLR housings. Nauticam had its spectacular ”endoscopic” prototype 150° Field of View wet lens on display. This lens will likely have a very limited market but, it will open new Close Focus Wide Angle possibilities by allowing the lens to get closer to the subject. The boot is “the” place to look for ground breaking innovations. For me, it was that underwater inertial navigation instruments are becoming a reality. These offer a real potential for changing the way we dive. Imagine being able to precisely mark locations, record tracks or navigate to pre-set waypoints like you do on land with a handheld GPS. Ariadna Tech presented their prototype POSiO underwater navigation system. Combining information from GPS, accelerometers, pressure and gyros; it learns the diver’s kick patterns and converts them into speed and track position. 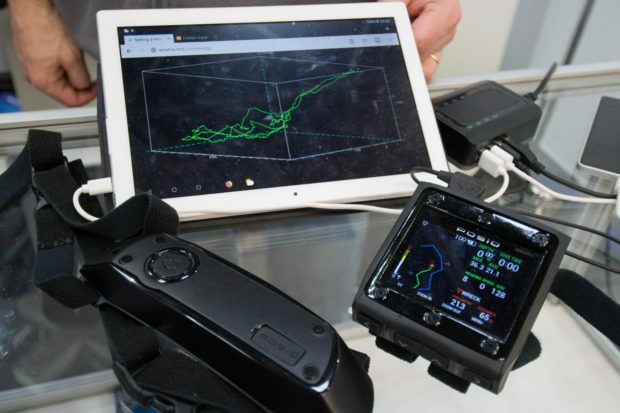 This is accomplished with a compact two-components system consisting of a calf-mounted sensor the size of a dive knife coupled with a display unit similar to a wrist-mounted dive computer. They claim a 10 meters precision over a 500 meters 3D track. The POSiO navigation unit still in development and, with a target price of 2 500 euros, it is aimed at the public market. Seacraft, a DPV manufacturer, showcased the ENC2, their second-generation Electronic Navigation Console for scooters. Priced at around 1 300 euros with all accessories, the ECN2 is definitely more palatable. It takes advantage of an external DPV-mounted speed-sensor which helps with accuracy. Preliminary results indicate a 5% track length accuracy.